When the new Microsoft Surface device was announced, I decided to dive in and become an early adopter. I promptly ordered a Surface (with Windows RT) and was pleased to get a confirmation e-mail indicating that I would receive my surface on 26 Oct, 2012–the same day that the Surface RT launched. I’ve had the chance to start using the Surface RT over the past few days, so I thought I’d share some of my first impressions. In this first post, I’ll offer up my thoughts about where the Surface fits into the mobile devices ecosystem and who the target market is. In future posts, I’ll dive more into using the Surface for a variety of tasks. (Note: “Surface RT” is my shorthand for Microsoft’s official name of “Surface with Windows RT”. This is to contrast with “Surface with Windows 8 Pro”, which will ship in January, 2013). I opted to go “all in” and got the 64GB model with the Touch Cover. Touch Cover or Type Cover? Touch Cover – $119.99 (if bought separately), pressure-sensitive keys, 3.25 mm thick, 0.46 lbs, comes in Cyan, White, Magenta, Black, Red. Spill resistant. Type Cover – $129.99, mechanical keys, 6 mm thick, 0.55 lbs, comes in black. Includes function keys. So you want the Type Cover if you want a keyboard with keys that actually move. You want the Touch Cover if you want your Surface to be 3 mm thinner, you need a stylish color for a keyboard cover, or you expect to spill a hot cup of coffee all over the keyboard. I drink a lot of coffee, so I went with the Touch Cover. Both keyboards also include a trackpad. It’s also worth mentioning that since the Surface has a USB port, you can plug in an external keyboard or mouse. Since you only get one USB port, it’s a Sophie’s Choice situation and you have to pick which one you’d rather use. In all honesty, this makes complete sense–I can see plugging in an external mouse, making it easier to work with the desktop-based Office applications. But I’m less convinced that you’d want to plug in a full-size keyboard. Since I haven’t yet talked about using the Surface, it’s perhaps premature to compare it to that other tablet. And Microsoft may tell you that they are not competing directly against the iPad or targeting the same market. Still, plenty of buyers will be making a buying decision between these devices, based mostly on the bullet item list. So it’s worth considering how the Surface looks on the showroom floor, as compared to the iPad. There are even more SKUs for the iPad than the Surface–I counted 14 different iPad SKUs. Let’s just line up at least one of the iPad models to see how it compares to the Surface. So $100 more for the iPad gets you a higher resolution screen, better camera, and a lot more apps–while giving up the extra microSD and USB ports, as well as the ability to attach a Touch/Type cover. I’ve grown up knowing Microsoft as a software company. They’ve had a few forays into hardware markets, some of which worked out well (e.g. XBox, the $1+B warranty costs notwithstanding) and some that didn’t (e.g. Zune). But other than XBox, they still make most of their money off of software–Windows on the desktop, Windows Server, and Office. At roughly $18 billion a quarter, they’re doing pretty well–until you consider that Apple’s revenue is nearly double that of Microsoft’s and that most of it comes from selling mobile devices to consumers. The mobile device market has exploded in the past couple of years and iOS has mostly dominated the market, with Android now making serious inroads. Given the size of the mobile market, and the fact that it’s still growing, Microsoft absolutely needs to be a player in this space. They will continue to make lots of money off of software for many years to come. But to remain relevant, they need to grab a piece of the mobile devices market. Windows 8 is Microsoft’s bid for a touch-centric mobile operating system, competing against Android and iOS. But having a great software offering for mobile won’t do any good unless people start actually buying devices that are running Windows 8. This is the point where Microsoft is going all-in. It’s not enough for them to create a great touch-based operating system and then just hand it off to their hardware partners and pray that the partners get some traction in the market. This market is too important for Microsoft to entrust it entirely to their partners. They can’t afford not to build their own hardware device–one that showcases what they’ve done with Windows 8. Like Apple, they can then take a no compromises approach to the device, developing both the hardware and the software and controlling the entire user experience. Case in point: there is no third-party crapware on the Surface. Microsoft is, of course, hoping that their partners also do well in getting Windows 8 mobile devices into users’ hands. But building the Surface lets them stand out in front of the partners and show them what the user experience should be for these devices. That’s why the Surface RT and Surface Pro devices exist. The tablet market is an outgrowth of the smartphone market, both of which are mobile devices with a persistent connection to the Internet and enough horsepower to deliver a rich user experience. Smartphones and tablets are both targeted at a wide variety of users (which is why the market is so huge). This covers younger users, using smartphones for communication and social, all the way up to the 60+ crowd, using tablets for e-mail and web browsing. While the tablet is seen as more of a media and entertainment device, the smartphone is seen as a device for communication and social. It’s easy to make the case that many users will regularly use both devices. During the day, they carry their phone, using it for texting, voice and checking social networks. In the evening, they plop down on the couch, pull out their tablet and use it to check e-mail, play a game, or watch a show (TV or movies). The tablet is therefore primarily a consumer-targeted device used for content consumption. This is our “post PC” era, where the devices that we use have evolved to better fit our model of using them mostly for consumption. People have been talking at length about the BYOD (Bring Your Own Device) phenomenon, with people bringing their tablets to work and expecting them to integrate seamlessly into the enterprise ecosystem. But iOS and Android devices have not yet made serious inroads into the enterprise. There are still many challenges, including: security, authentication and easy sharing of data. There’s also potentially a high development cost, as employees expect someone to port existing Windows-based enterprise applications to the tablet platforms. This is Microsoft’s big gamble and where they really hope to make inroads into the enterprise with Windows 8 tablets. A tablet based on Windows can bypass many of the typical issues with BYOD. File sharing becomes easier, Remote Desktop allows connecting to your desktop from home, and support for Active Directory makes authentication trivial. The gotcha for Microsoft is that BYOD doesn’t work unless users actually have the device to bring to work in the first place. There might be some cases where an enterprise will proactively acquire Windows 8 devices. But the more natural progression is that users will start out with a Windows 8 tablet as a content consumption device at home and then bring the tablet to work, where they’ll begin to use it as a productivity device. Surface for Windows RT is the first step along this path. It’s meant to be the consumer-focused device for content consumption. It’s the device for the couch. 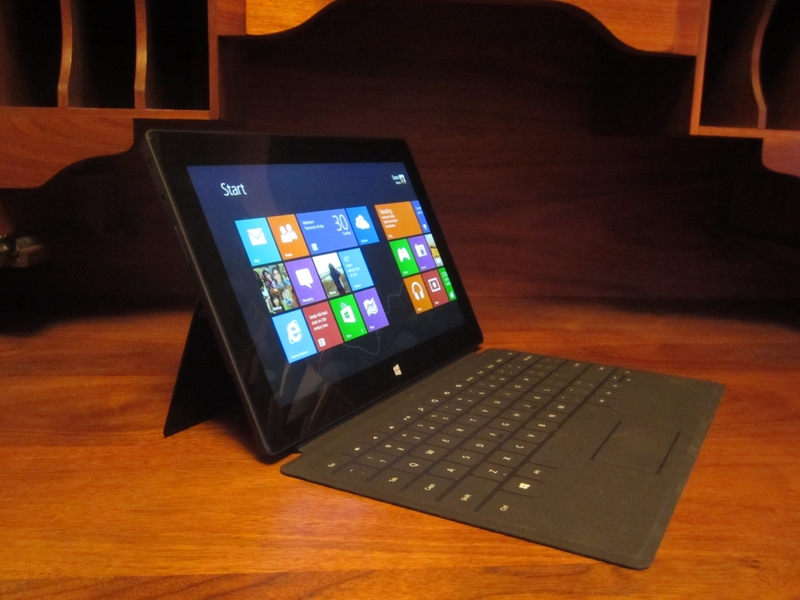 It’s big brother, Surface with Windows 8 Pro, is the next step along the path. It will be the device that you’ll want to bring to work, adding support for Outlook, Sharepoint, desktop applications and Active Directory. (Find Surface with Windows RT vs. Surface with Windows 8 Pro comparison here). At least that’s the idea. 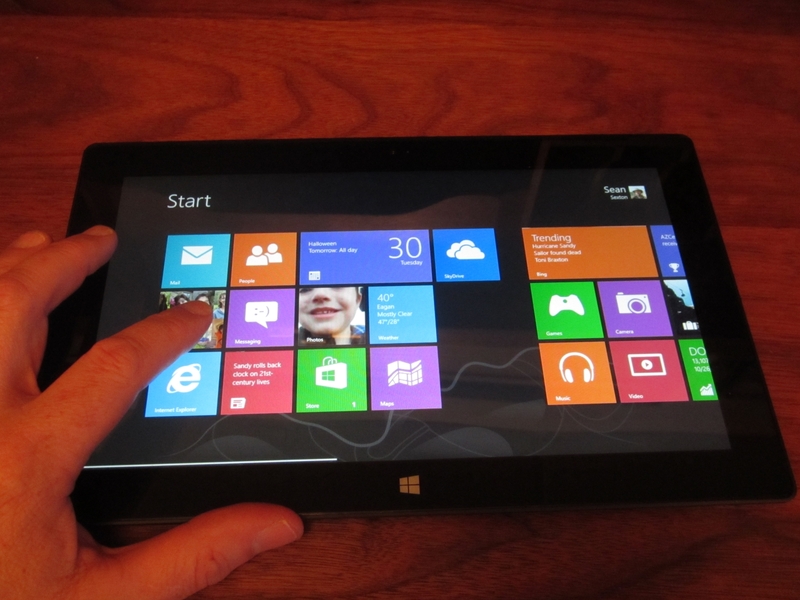 For the vision to work, Microsot first needs users to buy Windows 8 tablets. That’s enough for now. Next time, I’ll start diving into examples of specific things that I’ve tried using the Surface for. BTW, the usable space on the 32 GB version of the Surface RT is actually only around 16 GB. The rest is taken by the OS and the Apps pre-installed.